Fruit; small, roundish. Skin; greenish yellow ripening to golden orange, with numerous small black dots and some russety warts. Flesh; firm, crisp, sweet, juicy, pleasant flavour. [HP pl.LXXV/1878]. It was grown by Mr. Thomas Andrew Knight at his Wormsley Grange, Herefordshire nursery in 1792. ‘It is the offspring of the Orange Pippin, and the produce of a blossom, which was deprived of its stamens, and subsequently fertilized by the pollen from the Golden Pippin.’ Produces a very hardy medium sized tree which is a consistent and profuse bearer. ‘An excellent dessert apple of great beauty.’ It was also used as a cider apple but lacks tannin. Available October and November. [HP pl.LXXV/1878]. Listed in all published catalogues [Apple no.11/1843]. There are two references to ‘Knight’s Golden Pippin’ in William Macarthur’s records. Knight’s golden pippin. February-March. Great. Very small tree, highly flavoured but acid fruit, often mealy. Of 2nd value only but very early. [Notebook no.9, MP A2948]. This may refer to ‘Downton Pippin’ which see. 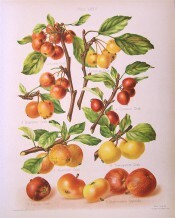 ‘Elton Golden Pippin’, ‘Knights Pippin’ and ‘Knight’s Golden Pippin’ are given as synonyms for ‘Downton Pippin’ ‘in different collections, according to the Pom. Mag’. [George Lindley – Orchard Guide p.28/1831]. Knight’s Golden Pippin. February-March. A succulent fruit highly flavoured but very sharp, apt to be mealy when first ripe. Good only for dessert. [Diary B, 1862, MP A2951]. This may refer to ‘Downton Pippin’ which see. The identification of this apple is doubtful. 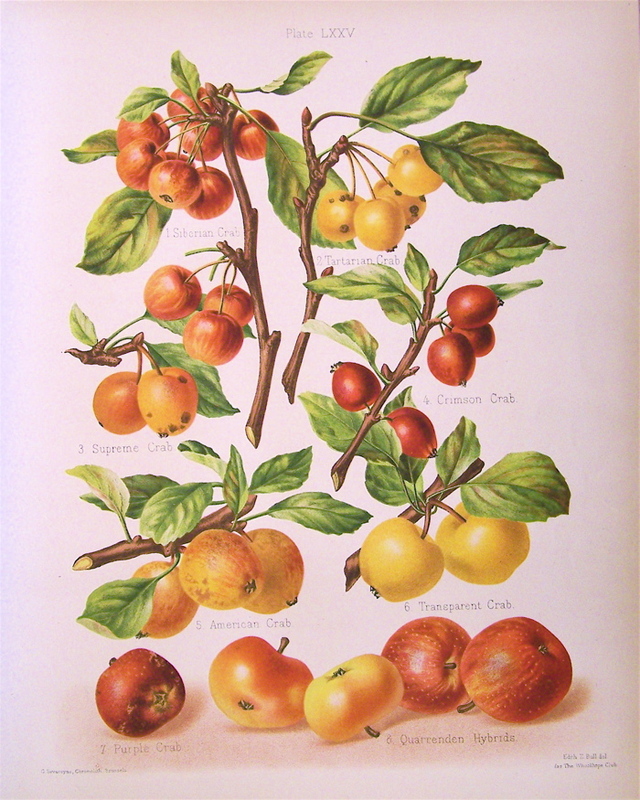 The illustration is of ‘Supreme Crab’, which appears to be a true crab apple, is somewhat at odds with descriptions of ‘Knight’s New Golden Pippin’.